The driver has to be 16 years or older. The passenger has to be older than 8 years old. All drivers must have valid ID. We will accept passengers only when the driver shows experience and / or skills. We will reserve the right to suspend any drivers that cannot handle his/her vehicle properly, or does not follow the guide’s instructions; this is to avoid any type of accident. On this tour the scenery is breathtaking, We will take you to an elevation of 1240 feet, to an abandoned castle, where you can see for miles in every direction. We will also take you to 5 different beaches and end the tour with some light refreshments (at your discretion) at a local restaurant. Another one of our most popular tours. Spend two and a half hours exploring the beautiful beaches along the south edge of the coast. We will visit 5 beautiful beaches taking ATV fun filled back roads: Flamingo Beach, Brasilito Beach, Conchal Beach, La Mina beach and bahia de Los Piratas. Along the way we will stop for refreshments (at your discretion) and beach swimming. From Flamingo to Tamarindo we will take you on a fun filled afternoon of cliff diving, snorkeling and more beautiful golden beaches than you could ever imagine. 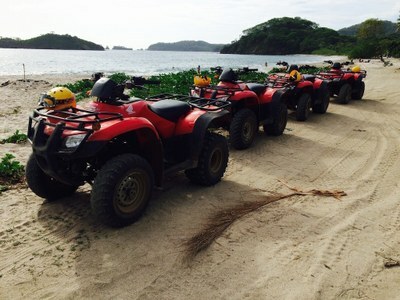 Our guided ATV tour will take you through the lush forest to the hidden beaches along the coast some only accessible by ATV. Along the way you will see various species of monkeys, birdlife and wildlife all from the comfort and safety of your ATV. Along the way there will be numerous opportunities for refreshments and food (at your discretion) as well as swimming and exploring. 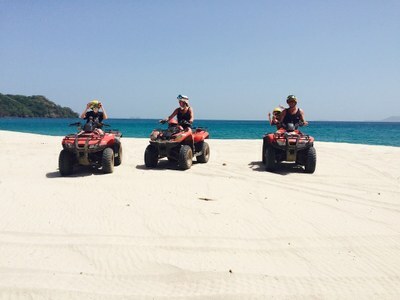 With some of the best snorkeling spots only accessible by ATV, we offer a snorkeling and ATV tour. We will take you to some of the best snorkeling spots that our experienced guides know and provide you with full snorkeling equipment to enjoy the tropical sea life that swim on various reefs along the coast. Wedding Proposals & Special Requests!